We’re coming up to Black Friday, so it’s a great time of year to put some money to one side for picking up the cheap deals. But what about the rest of the year, when you’re trying to top up your vintage style wardrobe while also e.g. saving for a wedding, or buying Christmas presents etc etc? Especially if you, like me, prefer shopping online – where do you nab those bargains in cyberspace? Particularly if you have your eye on certain brands that don’t come cheap? Hopefully, I have some of the answers for you here! Being a perennial bargain hunter, I can’t really help myself in terms of shopping around for the best deals. These days, I’m specifically trying to pick up the repro brands I love for less – because I want quality, I just can’t always afford the full price-tags that come with that. While you will never be able to get everything you love for £s off, sometimes it’s possible with a little effort and/or a little patience. Right, considering the time of year let’s start with the obvious one. Everyone knows that Black Friday/Cyber Monday is THE time to shop online for a bargain. Most shops will offer discount codes or knock down prices on select items, so it really is worth checking everything you have your eye on at this time – but quickly on Black Friday so that it doesn’t sell out (NB: I’m yet to see a repro brand start their sale earlier)! But apart from this time of year, the Christmas/Boxing Day sales are another key one to make sure you’re poised over your computer, if you can bear to drag yourself away from the eating and festivities (I will make time for cheaper clothes!). Actually, from just before Christmas until well into January most online shops will be selling off their winter stock, so this is a really good time to have a thorough browse. Same goes for when summer’s coming to an end – if you can bear to buy stuff you can’t wear for a year because the season’s about to change, this is a top way to pick up bargains and one of my main methods of shopping! This is, from what I can work out, a smaller, British version of Depop. The search functionality I prefer, because it will only search for items in your size once it has your details, so you don’t get that pang of sadness like you do in Depop when something you want comes up but in totally the wrong size. The downside is there’s much less on offer – I just don’t check this one as frequently as Depop. This one is aiming at the designer market and most of what’s on there doesn’t interest me. But when I’m searching for Vivienne Westwood x Melissa jelly shoes (embarrassingly often) I always make sure I check it out because this is exactly the kind of place they might pop up. Despite being a bit more ‘up market’, really good prices can still be had and the nice feature with this site is you can make an offer to the seller on any item and it’s encouraged, rather than frowned on as it often is on Depop, for example. If an Instagrammer you like doesn’t sell through their usual feed (and some do), you might find they have set up a separate Instagram ‘shop my closet’ account where they’ll often batch update when they feel like having a clear out. For example, Southern California Belle and Junebugs & Georgia Peaches often do this. If you don’t mind things that have been worn (often just once or twice), this can be a great way to pick up something sought after for a good price. Also worth noting that sometimes shops themselves will sell off end-of-line items for cheap on their Instagram accounts too. It’s a very active social media platform for our vintage-loving community, so it makes sense it’s all going on over there! There’s a few websites out there that sell off brands’ out-of-season stock for what they advertise as lower prices. Now, be careful about this. Oftentimes, I find that the prices listed are actually RRP or very close to it. This aside, it can be a way to pick up a brand you can’t buy for a reasonable price where you are because, for example, that brand is based overseas. In the UK, buying from Zulily is at its best when it’s a US brand and Zulily often have ‘retro and pin-up’ sales where they have several brands’ stock on offer. The ones I always watch are B.A.I.T. Footwear, Chelsea Crew and Bernie Dexter, who they have sales for fairly frequently and who are prohibitively expensive to buy over here because there are so few/no UK stockists (and the ones that have them mark them up to compensate for import taxes). This is a way to buy those brands without customs taxes which usually works out a lot cheaper than it would if you bought direct. My tip is if you’ve got your eye on something for sale in a certain webshop, always sign up to the newsletter before you make your purchase. Fairly often, you’ll receive a discount code as a thank you – which can vary from anything between 10-25% in my experience. Most shops will advertise if this is on offer on their website somewhere, but it’s not foolproof, so it’s worth giving it a go even if it’s not mentioned – you never know your luck! I’m sure everyone reading this will have at some point gone through the majority of the checkout process, but left before actually making that final payment, only to find an email appearing in your inbox a little while later to remind you you left something in your basket (duh, you know). Mostly you’ve done this accidentally, I’m sure, but I would advise you to do it tactically because sometimes shops will send you a discount code to entice you to finish your purchase. The crucial thing is you need to have gotten to the point in the purchase where you’ve at least entered your email, but I would suggest you go through until the point where you hit that ‘confirm order’ button and then shut the webpage down. The reason for this is you don’t know at which point in your journey the website’s trackers are set to contact you when you pull out of the purchase. If there is an automated campaign set up, you’re likely to get said enticing code within 24 hours, most likely a lot sooner, so it can be worth the wait. Pinup Girl Couture I’ve noticed particularly do this – and Bernie Dexter has for me too in the past. I’d never really paid much attention to Facebook sell groups until recently and it’s become apparent I’ve been missing out! For those that don’t know, they’re places that people sell items secondhand (but sometimes unworn! ), particularly for much-loved reproduction brands (although they do exist for true vintage too). The slight downside with these groups is that the people selling in them are usually also following them because they love the brand, which consequently means they know exactly what their items are worth, so the really sought after/rare pieces are not going to come dirt cheap. But there are definitely bargains to be had, particularly for pre-loved items, so it’s well worth joining a few. I follow the Bernie Dexter and Collectif group, but I know the Pinup Girl Couture one is very active too and there’s now one for Lindy Bop too. There are also some groups that are only open to your area – there seem to be quite a few in Australia, for example. So it’s worth having a search around on Facebook and seeing what you come across. If a blogger you follow collaborates with your favourite brands, it might be worth keeping an eye on their posts for discounts. Often when we strike up these partnerships, we’ll either ask for or be given a discount code for our readers. Brands that I’ve seen do this often are Hell Bunny and Voodoo Vixen – I myself have the discount code cicim20!% that will get you 20% off at hellbunny.com right now. Some bloggers will share these on Instagram too, so if you like our style it might be worth keeping an eye on who we’re working with! Ok this one is quite specific, but I feel like not many people know about it – and I’m really sorry for my readers outside the UK as it doesn’t appear they ship to you. If you are in the UK, you will know Clarks for making good quality shoes and having a variety of more timeless, classic styles on offer. Full price, they can be on the pricier side. But if you’re not bothered about having the latest styles (and hello, we’re into vintage fashion so that’s clearly not an issue! ), checking out their online outlet store now and then is well worth doing. Just look at these cute heeled brogues they’ve got for £19 currently! 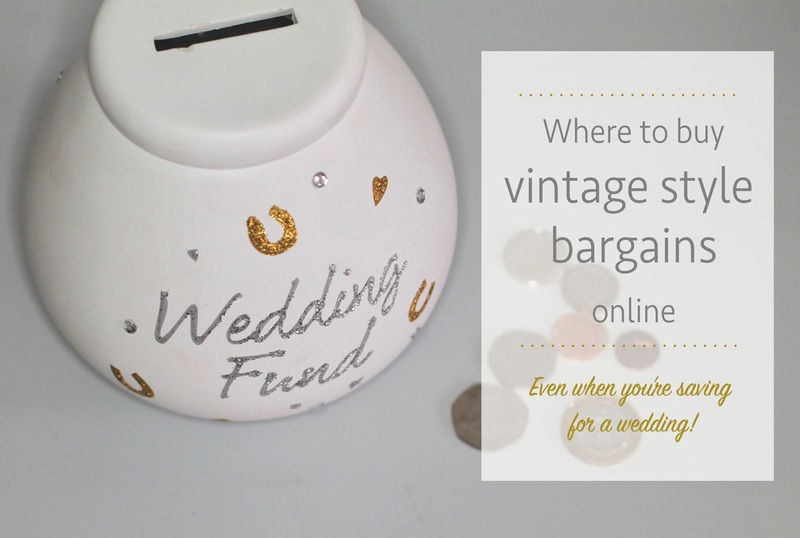 This isn’t an exhaustive list, it’s just my favourite ways to pick up bargains online. There’s a few other good points about shopping in the online and physical worlds in Miss Amy May’s post from last year, so I highly recommend checking that out too. Great advice! I love a bargain, and the bit about going through most of the checkout process and then leaving the page is really clever! I have gotten those "you forgot something" emails, but I don't think I ever read them – maybe I should start if they're offering me coupon codes! For people in the US, Thredup and Poshmark are resellers for gently used clothing from name brands. I am not sure how much vintage style you can find their, but I know Modcloth comes up on I think both of them, so while maybe not strictly vintage, they at least have some retro styles. Great tips, thanks for sharing 🙂 Modcloth re-sell would definitely be worth keeping an eye on! How did I not know about the Clarks outlet!!! I am definitely feeling enlightened. Thank you for the tips, I'm popping over to get some clarks bargains now! Woo hoo! !